Scribner got his professional musical start working as a church choirmaster and organist in 1960. He remained true to those roots throughout his career, retiring from his post as choirmaster and organist at St. Alban’s Episcopal Church of Washington DC in 2007. After one of Scribner’s first performances with the newly founded Choral Arts Society in the 1960s, a newspaper journalist with the Washington Post reported that he looked like a football player. During his brief service in the army, Scribner took with him three books, one of which was the music and text to Braham’s Ein Deutsches Requiem. 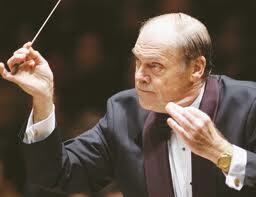 He conducted the same piece during his farewell performance last week. Despite being an award-winning choral society that has toured internationally, the Choral Arts Society of Washington has always been an all-voluntary organization. To learn more about Maestro Scribner, check out Katherine Boyle’s biography in the Washington Post, or the Norman Scribner profile on Naxos. The Choral Arts Society will perform a tribute concert to Scribner on June 13 at the Washington National Cathedral.